Since 2012, law enforcement officers in Arizona have been tasked with enforcing one of the country’s most controversial immigration laws. Whether or not an officer checks someone’s status can depend on things such as traffic that day or whether or not kids are in the car. And even when immigration officials are called, they will not always respond. You are an officer with the Arizona Department of Public Safety. You stop a driver on the highway. You suspect the driver is in the country illegally. Do you check their immigration status? 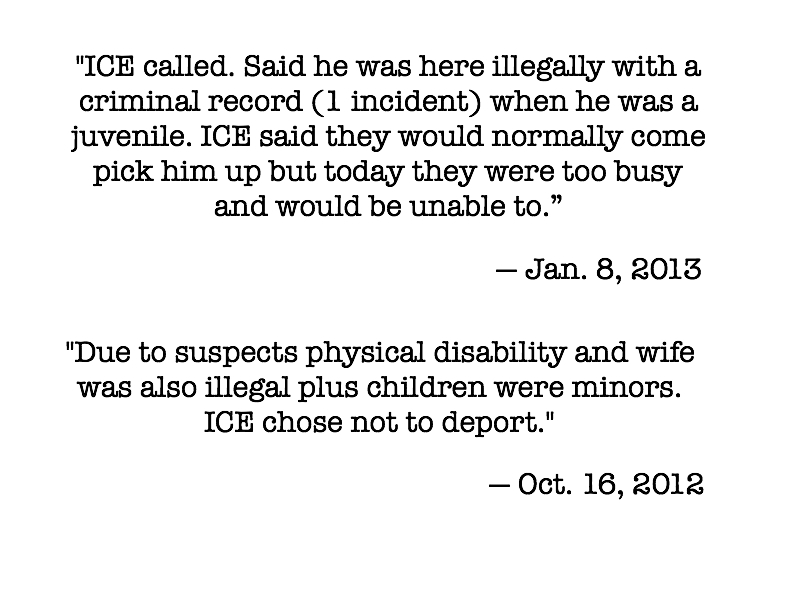 of DPS officers checked the immigration status of people they suspected were here illegally. DPS was the only agency whose records are comprehensive enough to reveal patterns in discretion. of DPS officers did not check the immigration status of people they suspected were here illegally. Whether you make a status check or not, if you suspect the driver is undocumented, thanks to SB 1070 you have some more paperwork to do. Didn't have a valid driver's license or an ID. Do you search the car? Vehicle searches occur in about 4 percent of all traffic stops. But vehicles are searched 65 percent of the time when an officer marked an immigration check. You suspect the driver is undocumented. Do you call the feds? Even when a call is made, federal officials didn't show up for about 13 percent of traffic stops with immigration checks. At least 5 percent of the time, immigration officials took so long responding that officers had to release the person to avoid running afoul of constitutional time limits. How does your stop end? 42 percent of cases where there was an immigration check end in arrest. Overall, only 1 percent of DPS stops end with someone detained. 78 percent of cases where there was an immigration check involve a citation, compared to 45 percent of overall stops. No license is the most common citation for people whose immigration status is checked. Because of this, a vehicle is impounded 41 percent of the time in these cases. Compared to 2 percent of the time for all traffic stops, regardless of whether or not the status was checked. Data from the one Arizona law-enforcement agency that collects comprehensive information on SB 1070’s effects spotlights the difficulties the state has had in trying to force change to an immigration regime dominated by federal, rather than local, priorities. The law was supposed to standardize local immigration enforcement across Arizona but broad inconsistencies exist across agencies, and sometimes within them. Source: Arizona Department of Public Safety traffic stop data from 2010 to 2013 and "suspected illegal alien information" data from May 2012 through Jan. 2014. Photos: Arizona Daily Star archive. Police siren sound by MultiMax2121 from freesound.org. No Timely Response was built by Luis Carrasco, Dan Hill, Amanda Nicole Martinez and Perla Trevizo. Traffic stop data in this project were first reported in an Arizona Daily Star series on enforcement of SB 1070. Our team experimented presenting the data as an interactive game, but we need your help finding more stories in the dataset. Download the Arizona Department of Public Safety traffic stop and immigrant status check data here.